Normally, fashion choices involve a tradeoff between functionality and style. When you’re in a professional kitchen, however, style goes out the window. 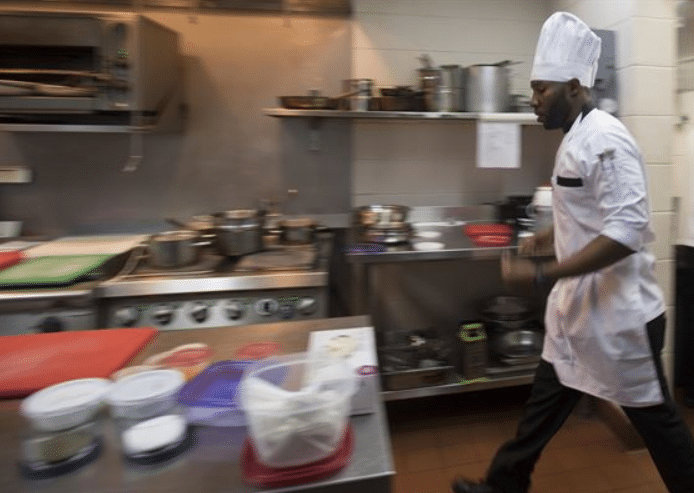 Nearly all shoes for chefs in the kitchen are ugly, non-slip designs with lots of grip on the bottom and liquid-resistant material that’s easy to clean after spills and mishaps. Many brands make shoes that are specifically designed for use in professional kitchens. Truthfully, these dedicated chef shoes often miss the mark. As long as the pair of shoes you intend to wear is comfortable and has a non-slip bottom you’re probably fine. Many professional chefs choose simple sneakers or even work boots as their go-to footwear when they’re on the job. If you’re having trouble choosing, take a gander at these top options. We’ll go over some of the best shoes for use in any home or professional kitchen. Of course, fit and comfort are top priorities, so be sure to choose a pair that will fit your feet well. This pair of basic Sketcher’s slip-ons is available in two materials. One option has a light, breathable mesh fabric above your foot, while the other one has a more solid and spill-resistant leather. Both options are comfortable, fairly inexpensive, and come with a non-slip sole that performs excellently on the slippery floor of a professional kitchen. The big difference between these two pairs is the way they handle spills. The mesh fabric is somewhat water resistant and does an okay job of recovering should you spill any liquid on your foot, but it’s definitely not going to keep a hot soup from penetrating your shoes and soaking your socks and feet. The leather, on the other hand, is less breathable and more expensive, but it will do a pretty good job of keeping your feet dry through minor spills. While these shoes are accessible, inexpensive, comfortable, and non-slip, they’re not especially durable. Expect to notice some wear after a week or two of use. It’s tough to estimate exactly how long they’ll last, since every kitchen is different and people put different amounts of wear on their shoes, but you probably won’t be able to use your pair of Sketchers slip ons for much more than a year. Of course, given how inexpensive they are, this isn’t necessarily a bad thing. The biggest advantage of this pair of shoes is the fact that it’s from a normal brand that you can buy at the mall. This makes sizing incredibly easy — just head on over to your favorite department or shoe store and try on a pair inside. You can probably beat their prices on Amazon, so be sure to order the shoes you actually buy online. I mentioned comfort earlier, but it’s worth noting that both the leather and mesh versions of these shoes come with memory foam insoles that make them incredibly easy to wear for long periods of time. Lots of first-time line cooks and sous chefs will pick up their first pair, realize how comfy they are, and grab a second pair to just wear around town. The neutral stylings of this basic shoe make it quite acceptable to wear in just about any setting, especially if you pick up the nicer pair of leather shoes. I don’t necessarily think that these are the best kitchen shoes around. I do, however, think that they’re the best choice for your first pair. Picking up a cheap pair of Sketchers slip ons won’t put a lot of strain on your budget and will give you an excellent comparison point for future pairs of shoes. It’ll serve as a low-cost, comfortable introduction to the world of culinary footwear. For female chefs, these non-slip boots offer an excellent blend of fashion, utility, and, more importantly, protection. Tucking the tops of these shoes into a pair of pants ensures that no spill will ever reach your feet. The comfortable insoles ensure that you can wear these all day without any issues, while the non-slip soles mean they’re compatible with most working environments. So why this pair over a set of dedicated kitchen boots? To be honest, I think that this pair of boots has some of the best restaurant work shoes beat as far as price, fashion, and comfort are concerned. While you can probably beat these women’s kitchen shoes in one of these three categories, it’s very difficult to beat them in all three. As far as I’m concerned, the biggest advantage of these boots isn’t how they perform in the kitchen, but how they perform outside of that. Many of my colleagues dislike wearing the same pair of shoes day after day since it doesn’t ever give the shoes any time or space to air out and recover. By adding a pair of multi-purpose boots like this to your closet, you’ll help all of your work shoes last longer and smell a bit nicer. You also get the added benefit of having a pair of non-slip water-resistant boots that you can wear around town whenever you want. If you’re not a fan of the way kitchen clogs work or you want a set of inexpensive work shoes you can wear around town, these non-slip boots offer all of the features you need at a pretty affordable price. They tend to run slightly large, so think about purchasing your boots a half-size lower than the shoes you normally wear. When it comes to pure comfort, it’s hard to beat regular old Crocs clogs. These breathable sandals offer lots of air to your feet, enabling them to relax as you work. If you don’t mind the open tops, they’re a top choice in many kitchens around the country. To me, however, the open tops are actually a pretty big deal. You won’t necessarily spill liquid on your feet on a regular basis, but when you do, having big holes in your shoes will ruin your day. You’ll have soggy socks and moist feet for the rest of your workday unless you have a pair of backup socks you can change into. There’s also something to be said for having a snug, well-fitted shoe. Something that laces up and molds itself to the shape of your foot is sometimes more comfortable if you’re walking and standing all day, which you tend to be doing in a professional kitchen. If you think you’re one of the folks who prefer something with laces, you’ll definitely want to skip these crocs. As far as value goes, it’s very difficult to beat the low cost of these shoes. They’re a great backup pair for anyone, even if you don’t like the open design or you want something snugger. The low cost of crocs means that they’re an appropriate addition to any closet. For me, crocs aren’t my primary kitchen shoe. Instead, they’re a comfortable set of slip ons that I can keep in my car should any mishap befall my primary pair. For many chefs, however, these open sandals are an everyday shoe with plenty of grip. They’re cheap, easy to clean, and very comfortable to stand in for long periods of time. 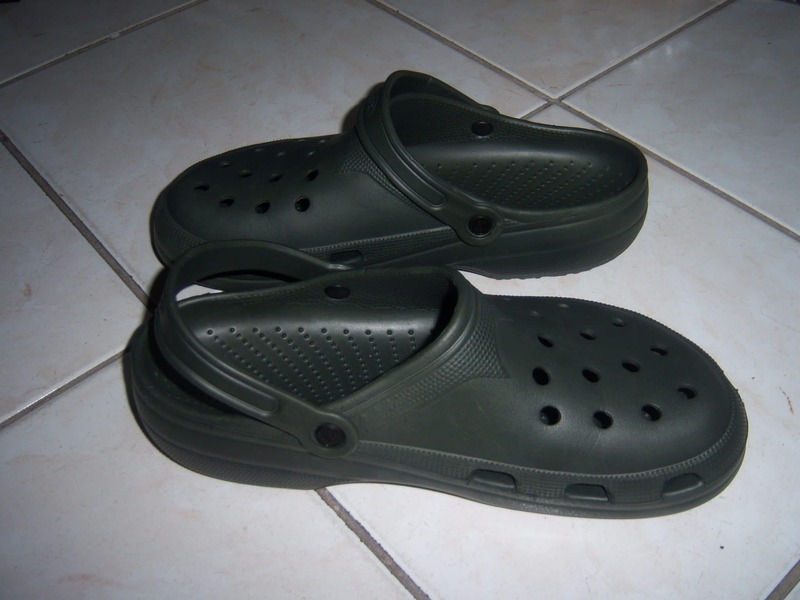 If you’d like a pair of inexpensive kitchen clogs, it’s hard to beat these crocs. These soft unisex high-tops are perfect if you’re the sort of person that wants a snug, laced up shoe. The waterproof fabric, non-slip rubber soles, and extra soft interior combine to make a shoe that’s perfect to wear all day, every day. 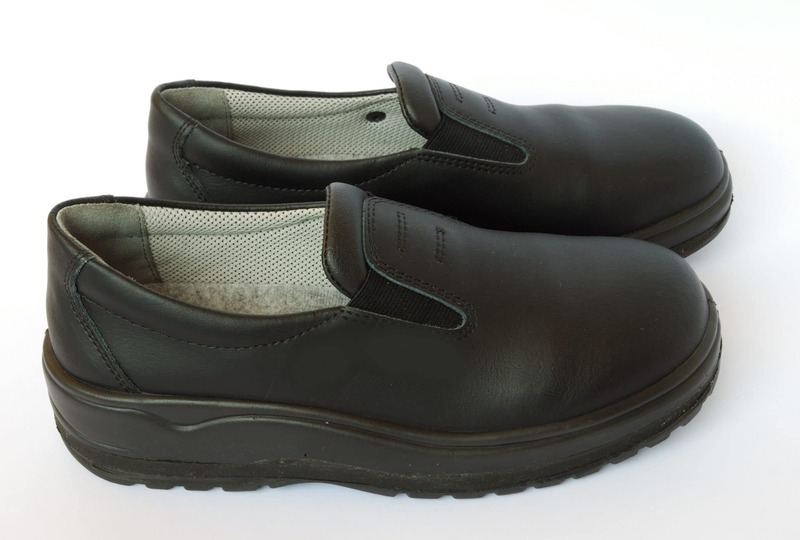 I think they’re probably the most comfortable non-slip shoes I’ve seen, including a pretty wide range of men’s chef shoes. The reason for this is simple: they fit snugly. I’ve alluded to this above, but it’s worth expanding on this point in a little bit more detail. These shoes actually hug your feet and apply soft, gentle pressure from all sides, which keeps them from rubbing around. It means that they fit more like a second skin and less like a cheap slip on. If you’re going to be wearing shoes all day, it’s nice to be able to avoid blisters and have a nice adjustable fit that lets your whole foot do the work of lifting your shoe. Of course, there are other reasons I like these boots so much. For one, they’re water resistant with closed tops, meaning that small spills won’t ruin your day. 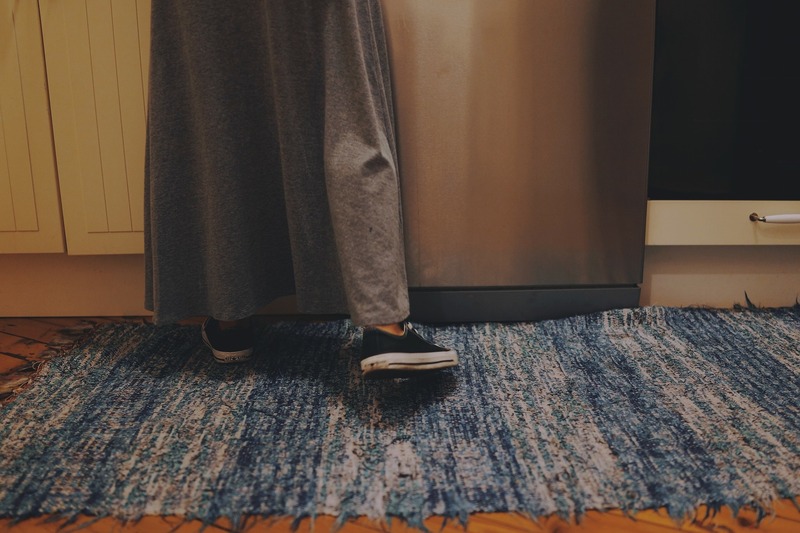 They’re also incredibly non-slip, with rubber soles that keep their grip on slippery kitchen floors with no problems at all. They’re also fairly affordable, so you can easily pick up a pair to try out without too much worry. As far as durability goes, these easily outperform many competing shoes. You might not be able to wear them forever, but having a pair last a couple years is easy to achieve. I like to rotate my work shoes in order to reduce wear, which helps ensure that I don’t have to replace them very often at all. These unisex kitchen boots are comfortable, soft, and effective. They’ll keep your feet dry and have plenty of grip. If you want a pair of boots you can wear all day in the kitchen, give them a shot. I’m not the biggest fan of these work shoes. They’re fairly pricey, not super comfortable, and there are some odd sizing issues that make it difficult to find a pair that fits. While they’re easy to clean and totally waterproof, I don’t think that these factors make up for the arduous process of having to order multiple pairs before you find one that fits. Of course, I’m not you. My feet are not your feet. Many chefs swear by their Birkenstocks, and their all-plastic dishwasher-safe design ensures that they’re pretty darn indestructible. A set of Birkenstock kitchen shoes will easily outlast a pair of cheap Sketchers, and the fully waterproof material will do a better job of protecting your feet. Many people think that the inside of these shoes is comfortable, too. While I’ll certainly admit that standing in a pair of Birkenstocks is nice, they suffer from the same problem as other slip ons: they’re not great to walk in. Because these shoes don’t have laces, they’re not particularly snug, and because they’re not particularly snug, they shift around a bit. Shifting causes blisters and foot pain and puts the weight of each shoe on a smaller area of each foot. If you get a pair that’s tight enough to not shift around, it’s probably because it’s too tight in a small area of your foot, which causes a different set of problems. For me, however, the biggest detractor isn’t the comfort or the odd sizing. It’s the price. I can pick up two or three pairs of Sketchers work shoes in my size for the price of one pair of Birkenstocks. 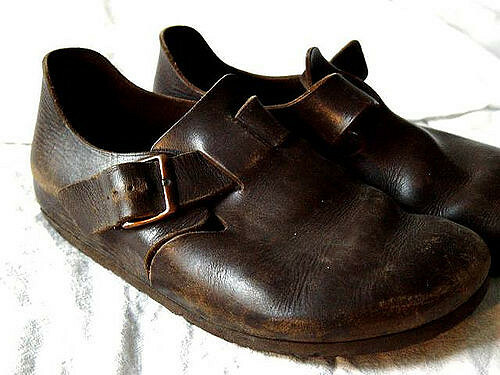 While Birkenstock shoes are somewhat more durable, I don’t think they last especially longer than two full pairs of Sketchers. Since I find them harder to size and I think that they’re less comfortable, I personally prefer the Sketchers. Any set of comfortable, non-slip shoes will work fine in the kitchen, but it’s very important to actually meet both of these criteria. A set of shoes that’s not suited for wearing all day, every day in an environment where you’re either standing or walking almost all of the time simply won’t work in a work kitchen. This means that fit and comfort should be your very top priority when choosing shoes for your job. There are other factors you should consider, too. For me, the most important other factor is how the shoes handle small spills. If something happens and I wind up dripping liquid on my foot, I want to ensure that my sock stays dry so that I’m comfortable for the rest of the day. 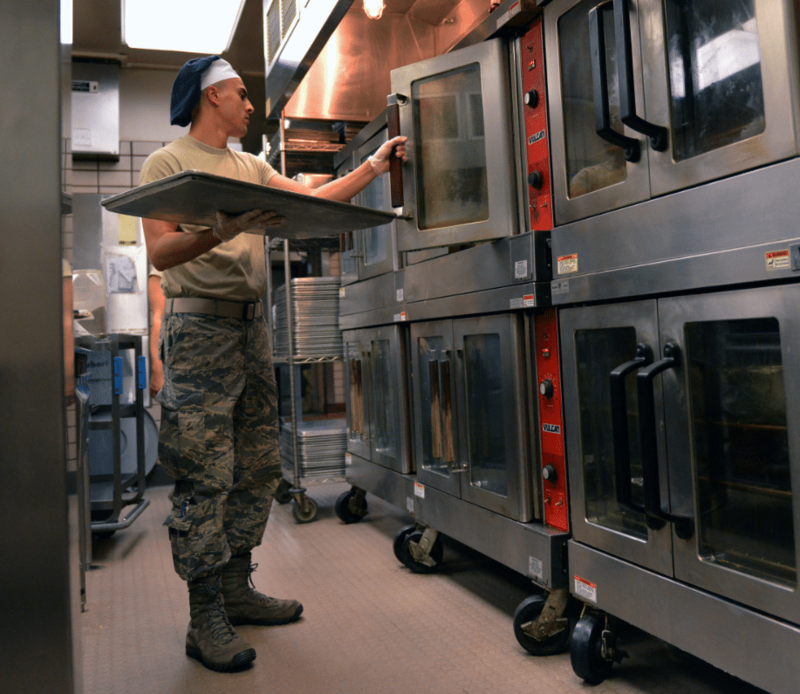 In some kitchens, however, this is less of a concern — or maybe you and your coworkers are just careful enough to avoid spills. Be sure to take a close look at all of the professional kitchen shoes above. You’ll find lots of great ideas and several pairs of very comfortable non-slip shoes that you can use in both your work environment and around town.